While the engine switch is in the “ON” position, move the shift lever with the brake pedal depressed. When shifting the shift lever between P and D, make sure that the vehicle is completely stopped. Shifting to the D position selects the most suitable gear for the particular driving condition. 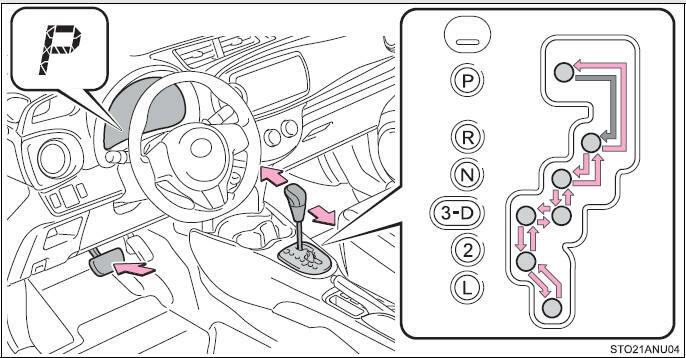 Setting the shift lever in the D position is recommended for normal driving. The maximum allowable speeds are as follows. AI-SHIFT automatically selects the suitable gear according to driver performance and driving conditions. AI-SHIFT automatically operates when the shift lever is in the D position. When driving downhill, there may be cases where the vehicle shifts down automatically to obtain engine braking. As a result of the downshifting, the engine speed may increase. Do not accelerate or shift gears suddenly. Sudden changes in engine braking may cause the vehicle to spin or skid, resulting in an accident.